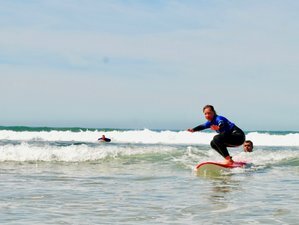 Enjoy a complete surfing experience with the best teachers who will guide you in learning everything that you need in order to enhance your surfing skills. Just 20 minutes away from Lisbon, you can have the best of both worlds, the city and the beach. Relax and enjoy your stay at the Soul Surf House, and after a long day of surfing, you can enjoy the on-site pool and make it yours. You will be staying at Soul Surf House. Located just south of Lisbon in Praia de Sao João, Costa da Caparica, Soul Surf House is the perfect place to stay during your time in Portugal. The friendly house is surrounded by nature and at a walking distance to the beach. It can accommodate up to 12 people in two twin bedrooms and two bunk bed bedrooms (four beds each) with shared bathrooms. There are barbecue facilities that you can use before or after you jump into the pool. Soul Surf House will let you use their bikes for free so you can ride around where you wish. Free Wi-Fi and TV are also provided. The house is fully equipped to make you feel at home, and you will be provided with hot showers, hairdryer, towels, and sheets. There will be lockers in your wardrobe, so this way, you can always have your things secured. You will use the best existing surfing materials, the Rip Curl wetsuits and surfboards which are suitable for different levels of surfing. Surf lessons are always in a group and have the duration of two hours. A maximum of six students per instructor will participate in each lesson. All instructors are certified, professional, and are equipped with high local knowledge. The surf school is located 800 meters from the house. The school is certified by The Tourism of Portugal and by the Portuguese Surf Federation. Former professional surfer David Luis, with a reference in surfing in Portugal, the former European champion, Wildcard at WSL CT Meo Rip Curl Pro Portugal in Peniche, and National Junior and National Master Champion, is the one who founded the surf school. This surf camp will be held in Soul Surf House, located just south of Lisbon in São João da Caparica, Portugal. Lisbon City Center is only a 15-minute driving or boat riding and the airport is 25 minutes away. Throughout the surf camp, you will be served breakfast daily. Soul Surf House will allow you to use their bikes for free. Hence, you can have some time to ride around where you wish. Please book your flight to arrive at Lisbon Portela Airport (LIS). Soul Surf House is a friendly house surrounded by nature and at a walking distance to the beach, ideally located for a perfect surfing holiday in Portugal. The rates for Easter season may be slightly higher than the standard rates, please contact the organizer for further details.